This is a classic! A Johnny Cash concert poster from the Dream Bowl in Vallejo, CA. 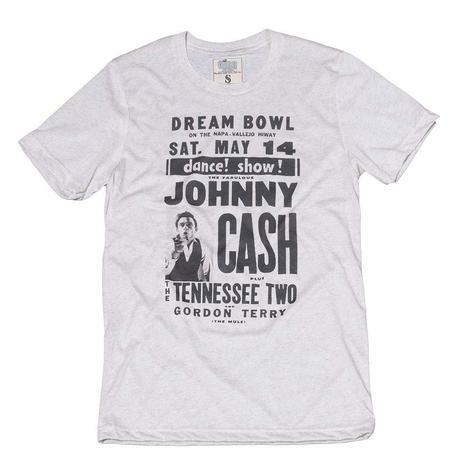 This is the perfect shirt for our Johnny Cash fans and is completely comfortable. 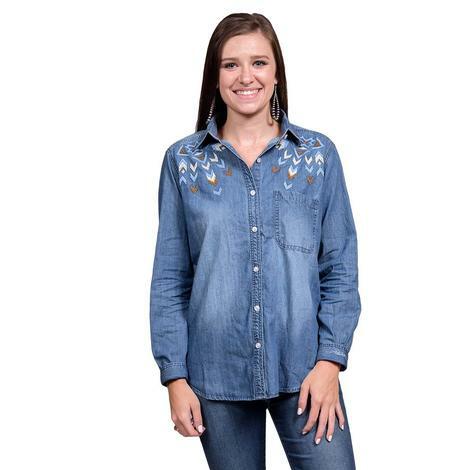 Match this shirt with your favorite pair of boots! 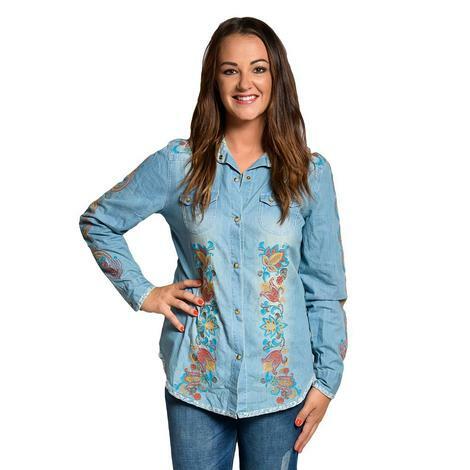 If your searching for a top that is going to give you a well put together look with outtrying, this is the shirt for you! 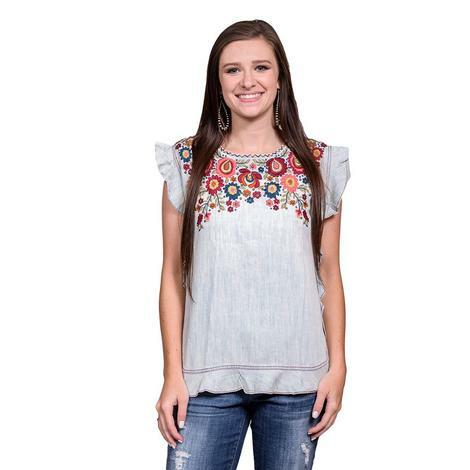 This handkerchief linen blouse has a colorful embroidery design that features floral, tribal and geometric patterns. Pair this top with your favorite pair of jeans and sandals or boots! 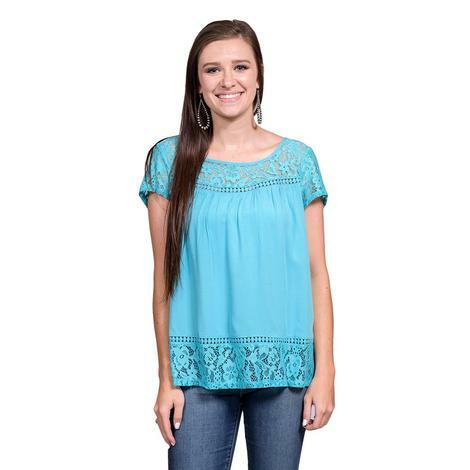 Enjoy a light style with this fun top. 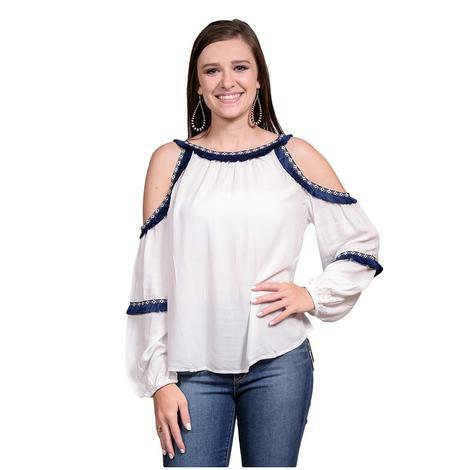 The short sleeves gives this top a top level of comfort and style, perfect for our chic cowgirls with a on the go life style. 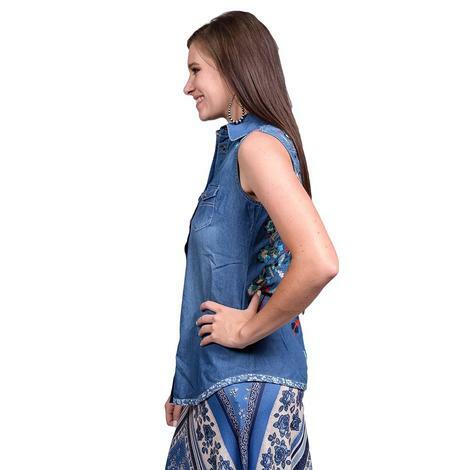 This top looks great with a pair of jeans or shorts! We love hats, and if you`re a hat lover like us then this is the shirt for you! This short sleeve tee shirt is super cute and comfortable and matches nicely with your favorite pair of jeans or shorts! 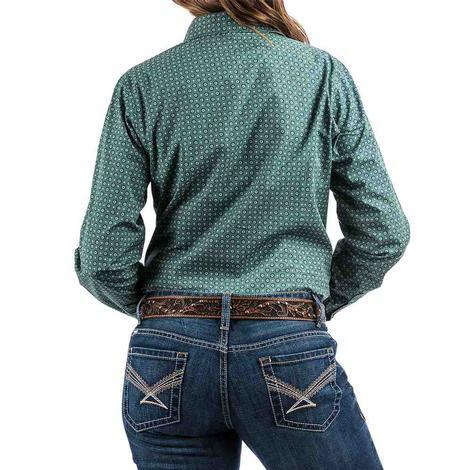 Show off your cowgirl side and get this shirt today! 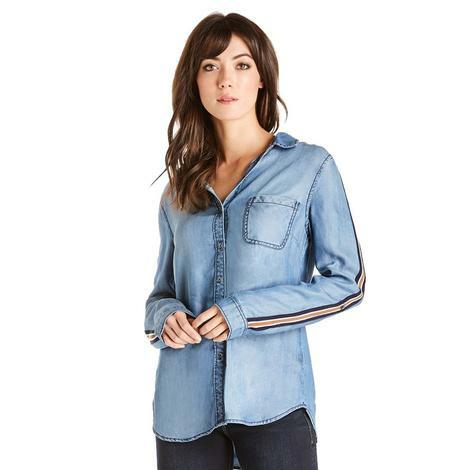 This Dear John Denim Women's Frankie Long Sleeve Shirt has a very feminine fitted style with one open pocket on the left side of the chest. This super fun shirt can be worn in so many ways - untucked, tucked in, even tied in the front. Each sleeve features an arm length navy, cream, and rust racing stripe from shoulder to cuff. 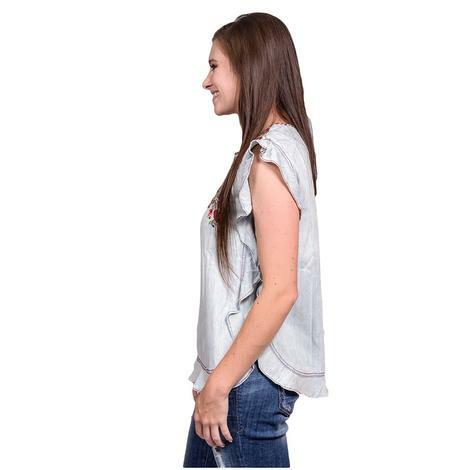 You can wear the sleeves down or rolled 1/4 way up and held in place with convertible sleeve tabs. This fun and flirty shirt is also made of sustainable, environmental friendly material. Add a little fringe to your closet this fall! 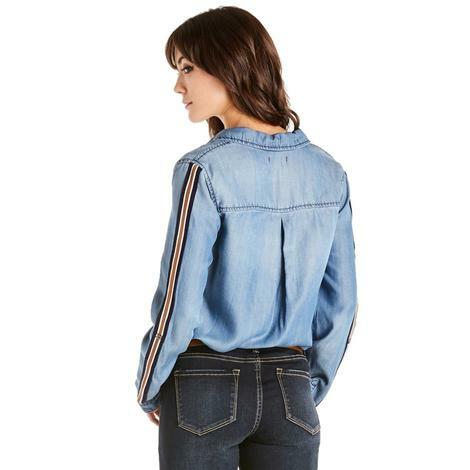 This 3/4 sleeve french terry top features a cross-over back and faux suede fringe along the bottom hem. 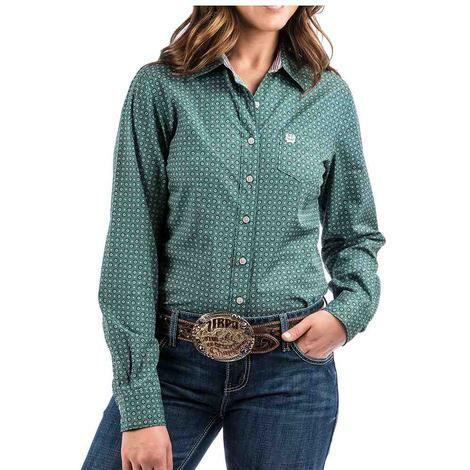 This Cinch green and white circle print long sleeve button down is made of 100% cotton. This shirt comes with an open front chest pocket and white buttons. 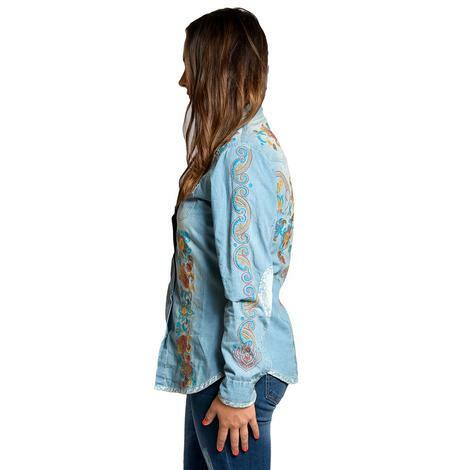 The Johnny Was Faience Riverwash Blouse features an intricate embroidery design that combines graphic border motifs with pops of faience patterns. With a scoop neckline and button front, long sleeves, this navy satin blouse is as figure-flattering as it is chic! 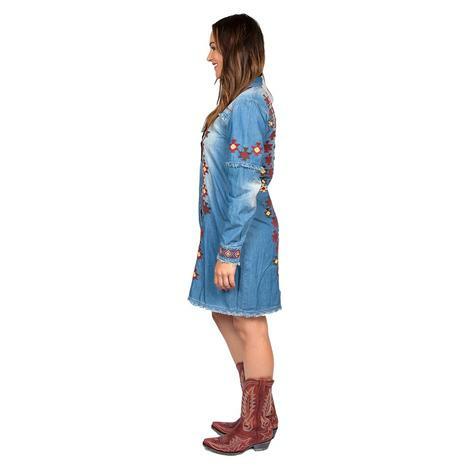 This fancy boho western dress by Tasha Polizzi is made from 100% cotton with pearlized snaps down the front and at the cuffs. Eyelash fringe is used to decorate the yoke, sleeves and hemline. The southwest style embroidery utilizes shades of brown, red, blue, green and tan. Machine washable. 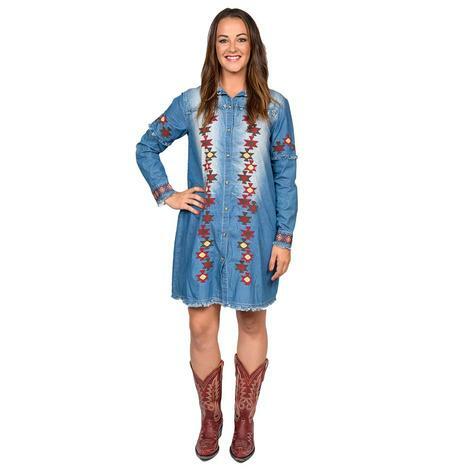 This western-style shirt by Tasha Polizzi has a spread collar, long sleeves, and colorful embroidery that you'll love. The distressing gives it a vintage look that makes this one a one-of-a-kind that's sure to be a favorite in your wardrobe forever. 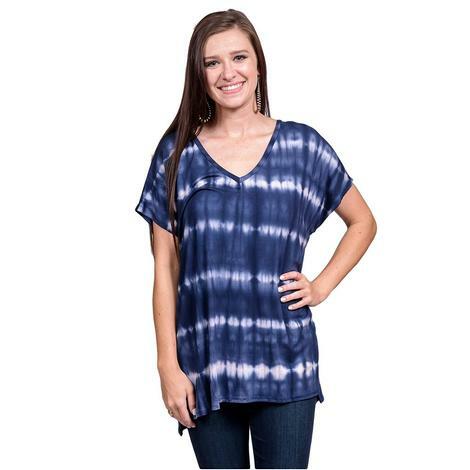 This tye dye plus size top has a loose fit and is made from 95% rayon and 5% spandex. Made in the USA. A vibrant tee-pee printed pattern on a black tee shirt by Tasha Polizzi. 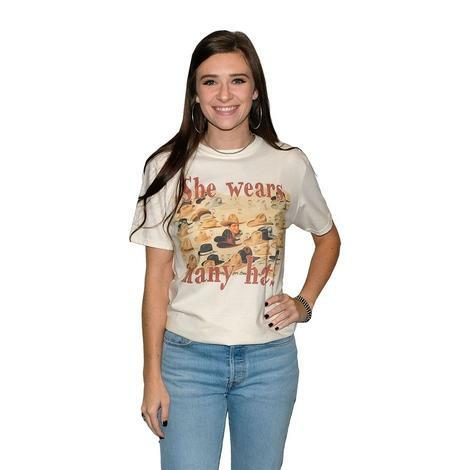 This will pair well with just about anything in your closet. This embroidered tank by Tasha Polizzi has cotton construction with intricate embroidery along the back. 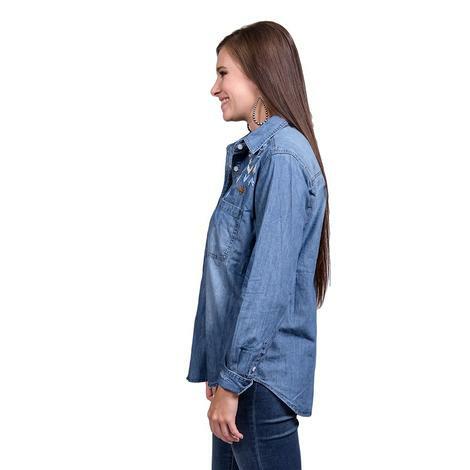 The snap-down front and double chest pockets enhance this shirt's classic western look. This gorgeous top by Johnny Was features unique style details from the lacy shoulders to the eyelet patterns that trail down each sleeve. Front tie detail finishes the look. 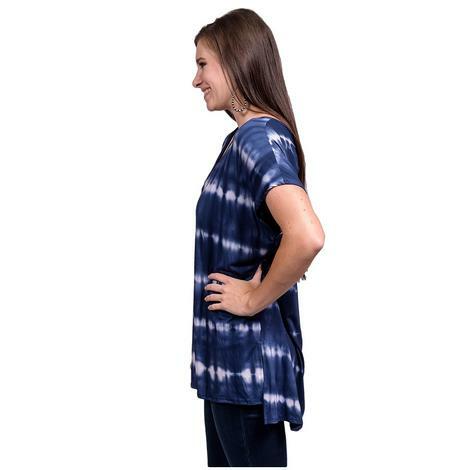 This shirt is made with 95% rayon and 5% spandex for a soft and comfortable feel every time. Perfect for the Spring and Summer seasons. This sleeveless flounce tank by Rock and Roll Cowgirl features mexicali embroidery on the front yoke and hot pink contrast stitching. Pairs well with STT jeans. 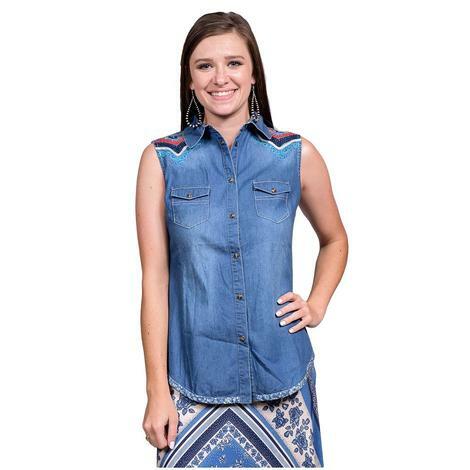 Ariat presents this maui blue fashion top. 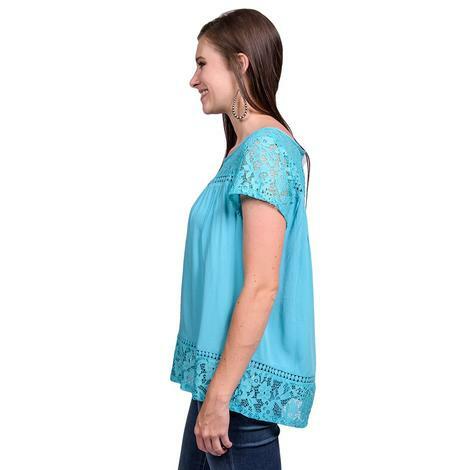 Features include lace trims, a split back, short sleeves, a scoop neck and a flat hemline. 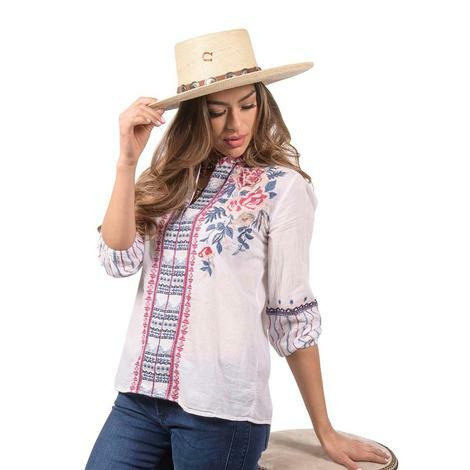 This denim embroidered shirt by Stetson is structured with a button front placket, single patch pocket and colorful Aztec inspired embroidery at front bust. Made with 100% cotton. 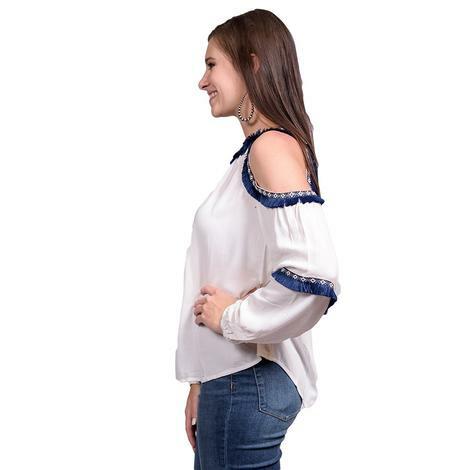 This gorgeous blouse has a flowy fit with a trendy off-the-shoulder style and contrast frayed trim. Pairs well with any pair of STT jeans or trousers. Add this to your cart today while supplies last! This top by Double D is a must have for the Spring and Summer. 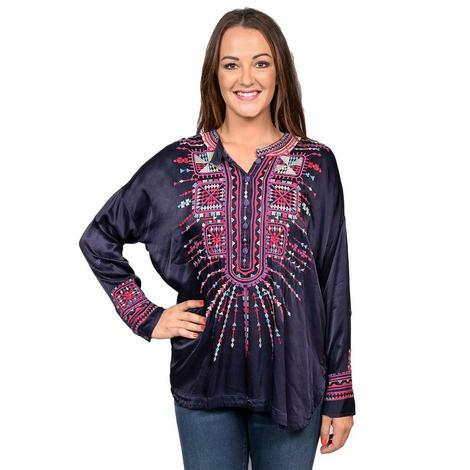 It's lightweight and comfortable and features colorful embroidery with studs throughout.